From Khajuraho we travelled via train across India into Rajhastan. 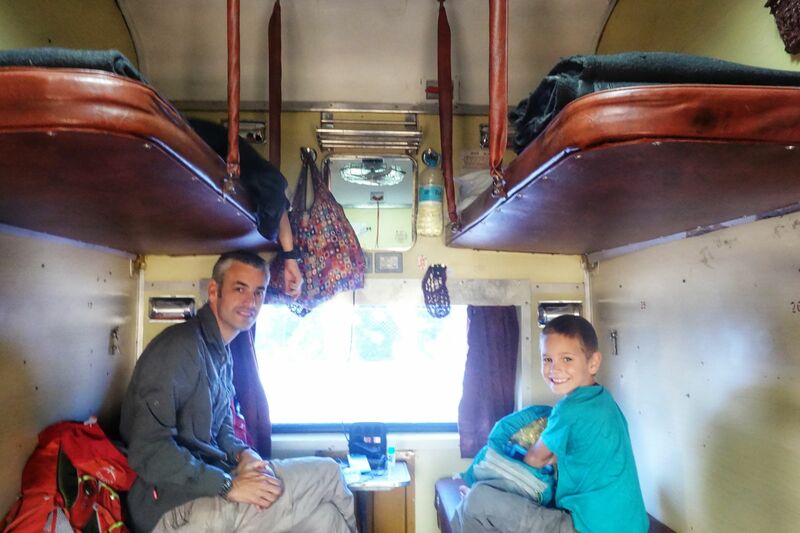 A fabulous and easy overnight sleeper trai – our favourite way to travel in India! Our first stop was the pink city, Jaipur. We found Jaipur with kids to be very enjoyable with lots to keep them entertained. Jaipur is part of the golden triangle and popular with tourists. It’s a large and busy city with its main focus being the pink city walls, as well as Amber fort on the outskirts. Within the pink city there are a number of activities and sites to visit. I find Jaipur is best explored by foot, but you do end up doing a lot of walking! It’s best to try and avoid the midday heat so plan your activities either early in the morning or late in the afternoon/early evening. 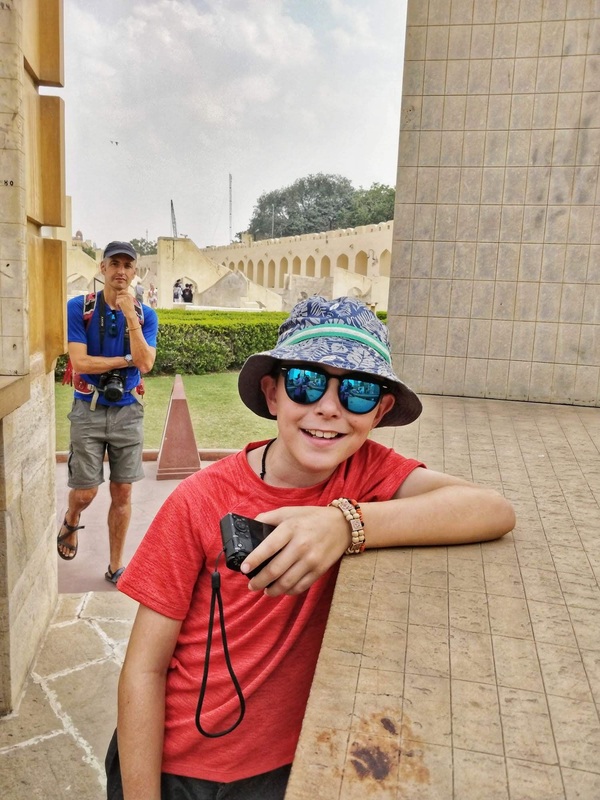 Kids who are hot and bothered are no fun, especially when you try and drag them around temples and palaces! There are a few hotels within the city walls, but we found them to be a bit above our budget. Instead we stayed at Hotel Kaylan in the Kelwar area. It is a little further our, but when you are on a budget you need to be adaptable. However, it took us around 45 minutes to walk to the pink city. It was easy enough using Google maps and took us past a number of shops en route. There were always tuk tuks at our hotel front door if we needed one. Situated 30 mins outside the city, amber fort is one of the must-see destinations in India. A fabulous fort situated on top of a hill. It is quite an impressive structure, even from a distance. It’s a great place to roam around and the kids enjoyed finding all the nooks and crannies. The place was very busy with your a groups so it’s recommended to get there early as they tend to arrive after 9am. We didn’t opt to get a guide, we never usually do. They boys have their own pace and being dragged around to listen to the history soon wears off. So instead we ventured in and out of all the rooms on our own. We spent a couple of hours there which was more than enough. The price to enter was Rs500 for adults and children are free! so make sure you organise with your tuk-tuk driver to stay for at least 2 hours to get your money’s worth. Note: There is a tourist option to take an elephant ride up to the palace gate (the walk up the path only takes 15 minutes). It’s impressive to see these gentle giants but we weren’t keen to ride them mainly as we had heard stories of mis-treatment so read up before you go. We arranged a price with a group of Tuk-tuks who were permanently outside our hotel front door. We negotiated Rs 400 return (including 2 hour wait), which is probably a little more than we should be paying – but when there are little options around it wasn’t too unreasonable. You are unlikely to ever get the ‘official’ meter rate! As it happens my favourite roof top cafe, the tattoo cafe, with lovely views over the city, nice food and friendly service – was right opposite here. After stopping for a drink to cool off, we ventured across the road to visit this unusual looking palace. It has soo many windows, many with blue, red, yellow & green glass giving off a distinctly colourful shine. From the outside the building looks huge, but looks can be deceiving. The interior is quite small! The boys were interested in visiting, as they had seen it on ‘all over the place’, which is a TV programme in the UK. Having seen it in real life put it into perspective for them. And for only Rs200 for international adults (Children are free) it didn’t break the bank. We spent about an hour wandering the corridors and taking photos of the kids peeping through the tiny ‘fairy’ windows as they called them! It’s open from around 9am to 4.30pm. 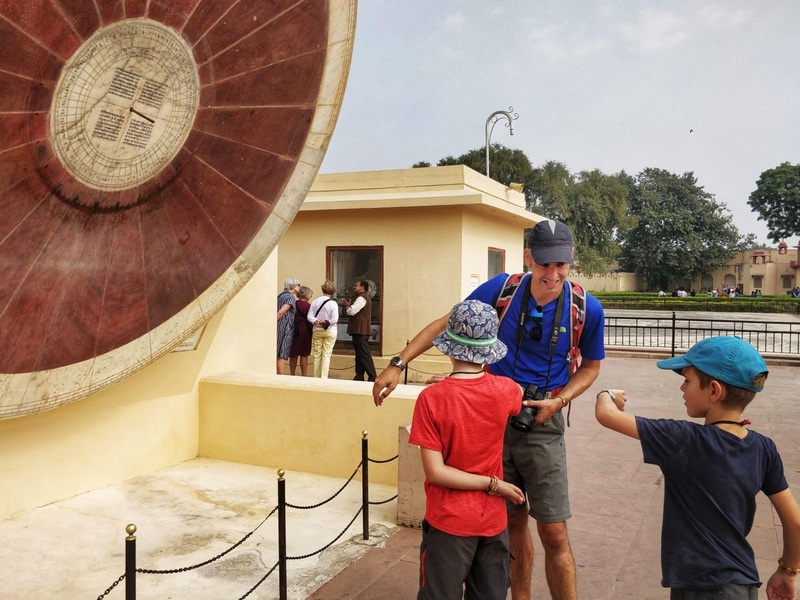 A great tick on the worldschooling list for lessons on astronomy and how to use sundials! There were lots of unusual looking structures which, as we checked, accurately told the time. However, make sure you visit on a bright and sunny day, as once the sun dipped behind the clouds all the clocks turned off! Again, there are options for guided tours, but we aren’t fans and the space gave our boys chance to run around. 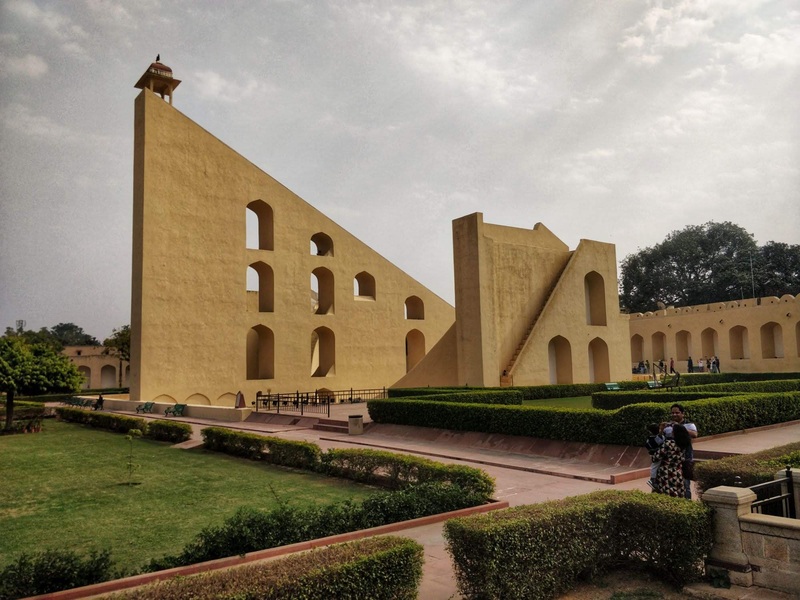 This is a great place to stop at after you’ve visited Hawa Mahal as it’s only round the corner.The price to enter is Rs 200 per adult (children under 12 are free!). It is open from 9am to 4.30pm. This surprised me as I expected it to be open later into the evening given it’s astronomical element. 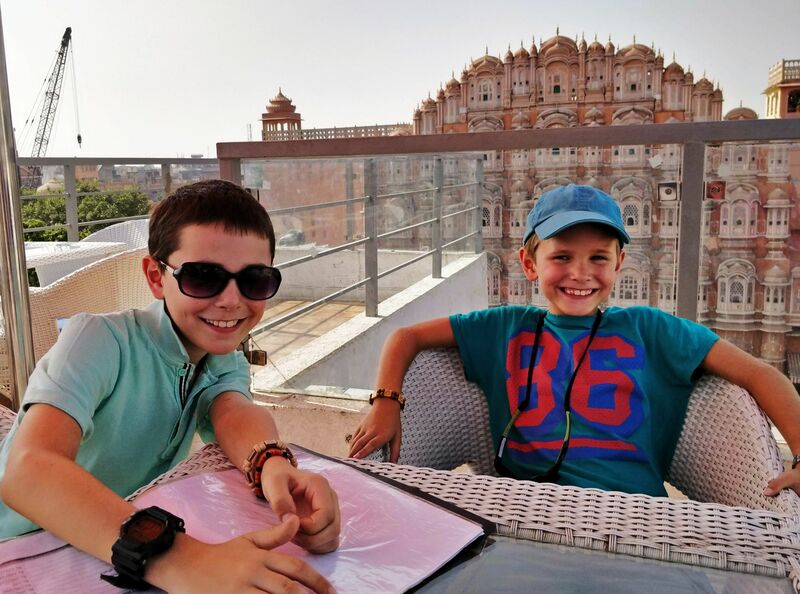 In addition to the activities above, plus walking the streets of the pink city, we decided against visiting the City Palace. 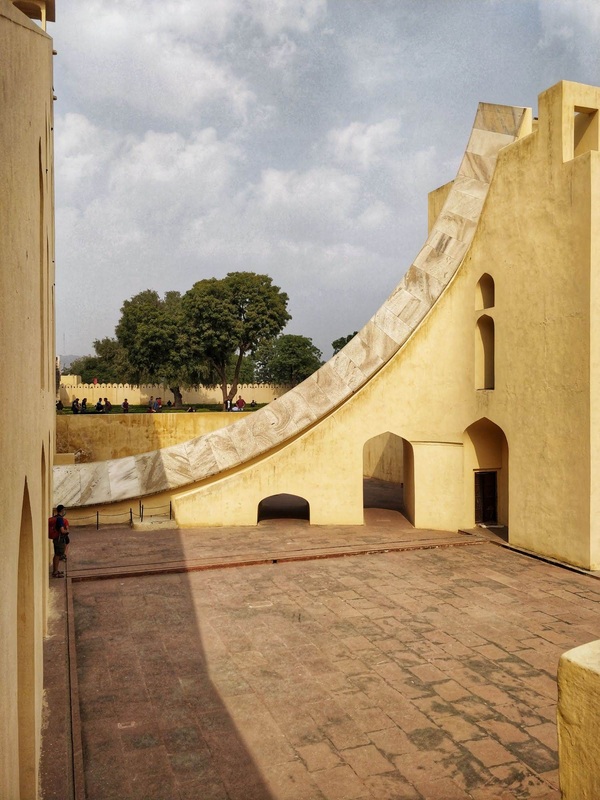 From what we had read it wasn’t going to beat the views and detail at Amber Fort or provide additional learning like the observatory. And for the price, we decided to give it a miss. However, if you did want to visit then the cost is Rs500 per adults & Rs300 for children 5-12 (international). Indian coffee house – it’s not fancy from the outside but serves decent and cheap food. They have similar menus across India and all for a very reasonable price. We had our usual masala dosa’s. Tasty, but the spice can range from place to place. Peacock hotel restaurant – situated across from our hotel. There is a rooftop restaurant with a local and international menu. The food was delicious here and we ended up going back a couple of times. It’s a little more pricey than we are used to but it suited or needs in terms of proximity and choice. Kaylan hotel restaurant – we ate here a couple of times but only for convenience. It had nice views from it’s rooftop but service was slow and I found them to be less enthusiastic about service. However, it had a good selection of local and international dishes which were nice enough and portion sizes were reasonable. But in all honesty, we actually preferred the restaurant at Peacock! Nibs Cafe & Chocolataria – you couldn’t get any far different from the Indian coffee house – this place oozes millenimill!! We stumbled on this place as it was round the corner and claimed to serve great coffee. It didn’t disappoint. As I mentioned, it’s was quite upmarket so not cheap but had a very modern feel, especially for India. Therefore, expect to pay higher prices. But for nice drinks – we decided it was a treat! We also found another one near Jaipur Mall. Tattoo Cafe – as mentioned above this was one of my favourite stops within the pink city, not only for the views and friendly service but for the lovely food and drinks. Oh! 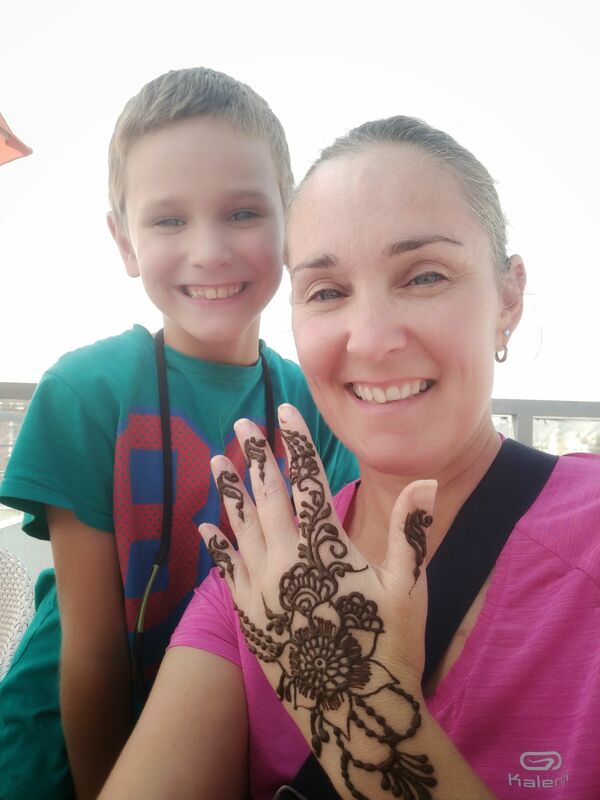 And I also managed to get a lovely henna done here!! It’s not your average eatery in Indian and has mainly international options, but when you’re hot and bothered this is a nice place to chill and relax under the umbrellas. 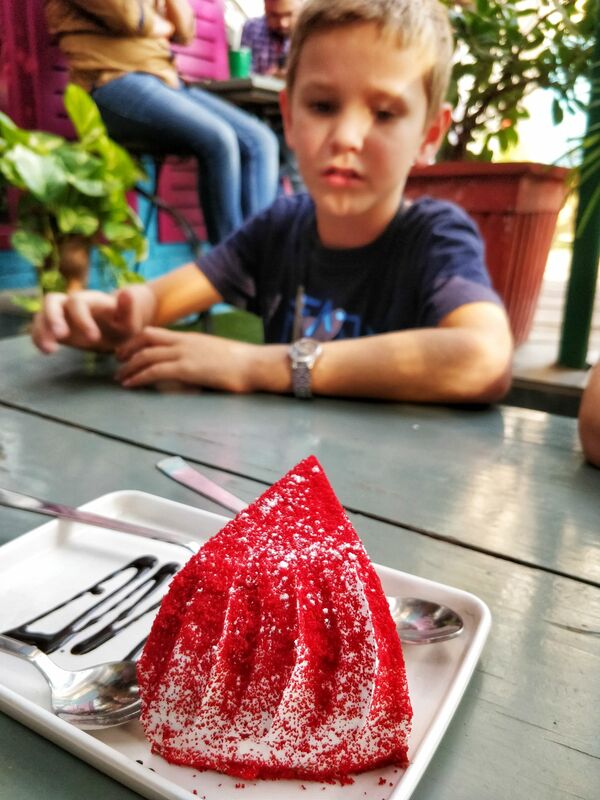 Anokhi Cafe – we only came here as we were meeting another family who were in the area. It was a nice, and again, modern cafe serving salads, pastas and hummus. Its a little pricey but a nice escape from the Indian craziness. There appears to be quite a few hip places within Jaipur if you step away from the Pink City area! A must-see visit if you are in northern India! It has lots of great activities to entertain the kids and great for exploring too. Plus, if you need to purchase anything the city has everything you need! Lots of tourists tend to come to this area as it forms part of the golden triangle. If you have time, aim to spend at least 4 days here so that you have chance to roam and fit in all in at the leisurely pace us traveller enjoys.